Does your little baby have cradle cap? If so, you might be wondering what the treatment is for this strange baby ailment. In and effort to fully disclose, this article contains affiliate links for products that I use. If you purchase something, I would receive a commission. For more information, see my disclosure page. Here you will find out what cradle cap is, and a few remedies to help your baby get rid of it! This is probably your first question. What the heck is this? It’s actually like baby dandruff. At least that’s how my pediatrician eloquently put it. It will make the skin around your baby’s head look patchy, scaly, or even really dry. There is no known cause for cradle cap, but the doctors at the Mayo Clinic do believe that it could be caused by overactive glands that produce oil in your skin. As a first time parent, you might be immediately worried about this nasty cradle cap. In reality, there’s really no cause for alarm. I will warn you, giving your baby a bath will freak you out just a bit! I gave my son a bath and his cradle cap looked awful. I got so worried I used too hot of water, but the water was just fine. It’s just that cradle cap looks STRANGE! How can you get rid of cradle cap? So…how do you get rid of this awful cradle cap? Well, there are a few things you can try. Using a baby comb, gently comb away the dry, rough patches from your baby’s scalp. This worked amazing for my son, but it did take time! Any time you are holding your little baby, grab a comb and lightly work on some of the cradle cap. Using light and gentle strokes, you can usually peel back some of those patches in your baby’s head. Another way to help get rid of this unwanted cradle cap is to wash your baby’s hair more frequently. Use baby shampoo and really target those patchy areas on your baby’s head. Be gentle though! Also, to help prevent any future cradle cap, it’s a good idea to wash your baby’s hair frequently. Ask your pediatrician how often they would reccommend. Here are a few reccommendations of products that will help get rid of your baby’s cradle cap. It’s what worked for my son, and I hope it can help your baby too! 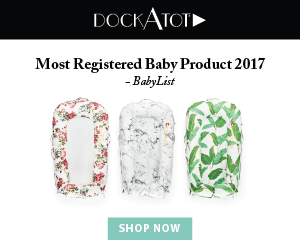 You might also want to make sure you have all the baby medicine cabinet must haves for any other ailments baby might encounter.
. The soft bristles are gently on your baby’s head and great for brushing out the flakes. The comb is essential for slowly peeling away the flakes on your baby’s scalp. If your baby has cradle cap, remember it’s like dandruff for babies. You can gently comb away the rough patches, and wash your baby’s hair more frequently to help get rid of it. Most importantly, know that it can happen to any baby so you did nothing wrong! Thanks for stopping by and reading! If you enjoyed this article, please take a moment and share it on Pinterest. Thanks!! Great post! My daughter had awful cradle cap. I found that using a little baby oil gel before using the baby comb helped the flakes to come out easier without crumbling into a bunch more flakes. It’s like you said, it’s almost like peeling it! So gross! Then I’d shampoo her. Best of luck, mamas!